Oh, the glamorous glittery goodness! 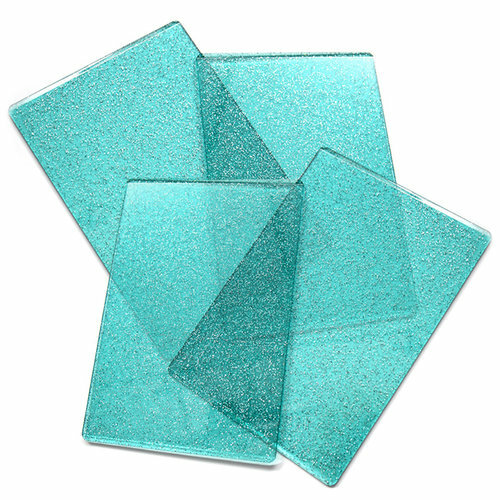 Dare to dazzle when you craft with the exclusive Ocean Blue Standard Cutting Pads by Scrapbook.com. 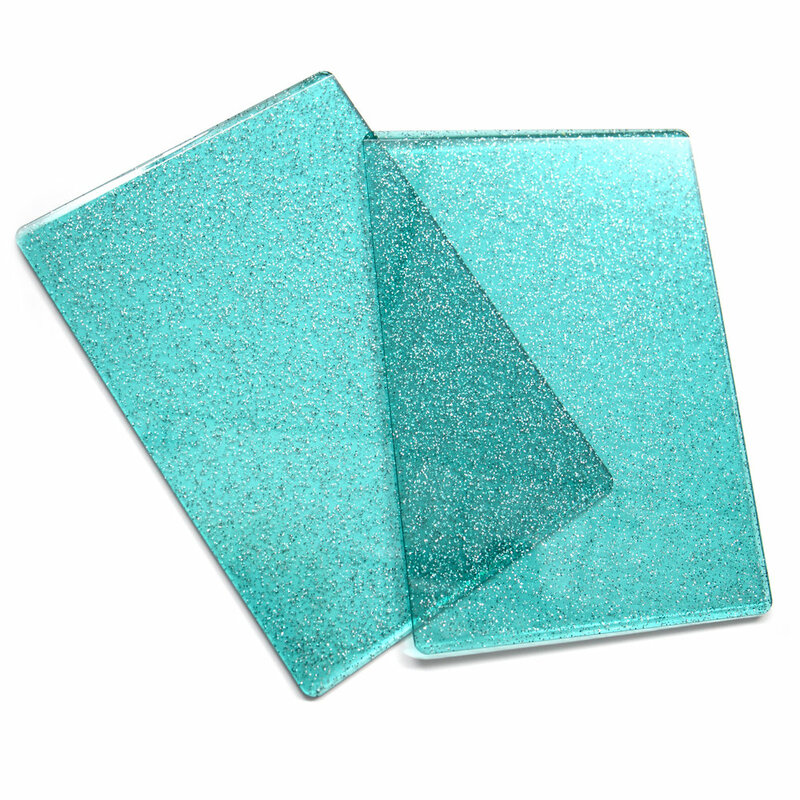 The cutting pads are embedded with sparkly and fun silver glitter in a high-quality polycarbonate plastic. Size: Each cutting pad measures 6.125” x 8.75” x 0.125"
You will love how easy it is to find these bright and beautifully colored cutting pads on your workstation. No more setting down clear plastic ones only to have to feel around until you found where you put them! The cutting pads have an awesome beveled edge making it easy to roll the platform through your machine. Flat edged cutting pads tend to leave a harsh line on your card creations, however with the featured beveled edges of these cutting pads, it’s easier when die cutting a card front allowing you to let the opposite side hang off the beveled edge. Add your second cutting pad on top of that, creating a "sandwich"
Run your die through your machine! 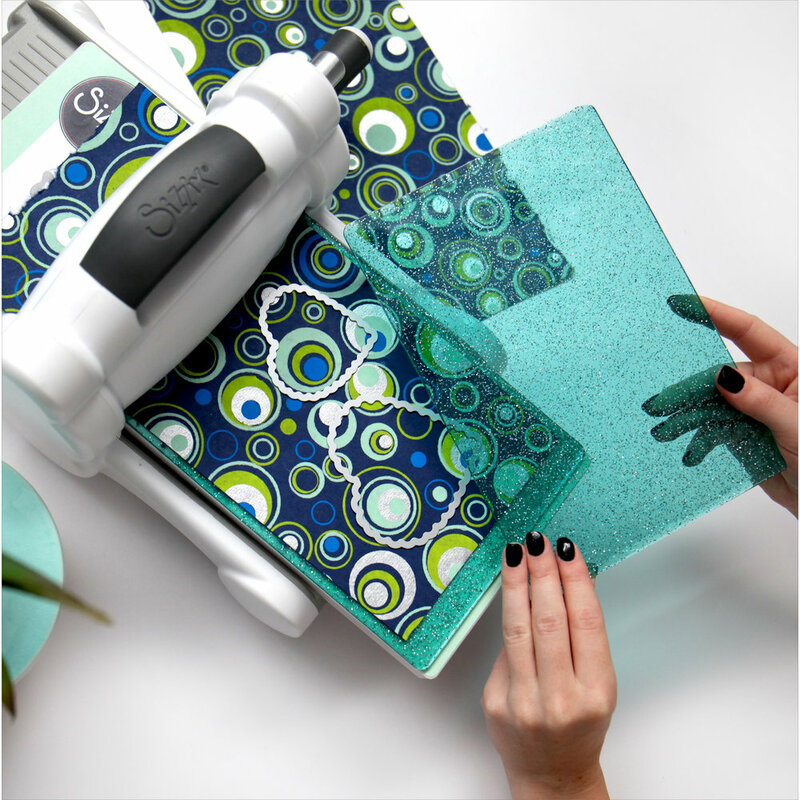 You will be excited to show off your trendsetting crafting style with these fun ocean blue cutting pads that are sure to add the right amount of dazzle to your die cuts! Get started making cool die cut shapes with these cutting pads that are compatible with the Sizzix Big Shot, BIGkick and Vagabond die cutting machines. Your friends will wonder where you got such unique cutting pads (they're only available here at Scrapbook.com!)! This is a Scrapbook.com Exclusive product! Tip: Flip the cutting pads over periodically to extend the wear! This product makes me SO happy! The color is bright and beautiful, which makes it easy to find on my desk when I'm working on a project. AND...who doesn't love glitter? I really like using the standard plates in my Big Shot Plus when I'm cutting smaller items. The beveled edges make it easy to roll the platform through the machine. This also helps when I have to die cut a card front and let the opposite side hang off the edge of the platform. The flat edges always seemed to leave a harsh line. I would totally recommend this product. Love the color, but they seem to be a bet lighter and less durable than other brands. ? I needed new cutting pads and these really do the trick. I like the colour and i can easily find them on my desk. I use only one on top and keep my old one on the bottom and then I get double use from my new pads. Thanks scrapbook.com for your excellent products. They were not the right size for my machine. My machine broke & I purchased a Big Shot machine to replace it & now I have the right size pads! I like the color. Now I know which is the top pad & which is the bottom pad at a glance! I Only use one cutting pad at a time because I keep my precision cutting plate on top of the magnetic platform. 2 cutting plates will last a long time and I have loved the new colors Sizzix came out with last year or so. But these Scrapbook.com exclusive cutting pads are really very pretty and they have an extra advantage...at least to me. There had been times with the other colored cutting pads that I would lose the edges because the colors of the cardstock would blend into the cutting pad. But with these, the glitter in the pads shows me where everything is. The glitter is well seated into the acrylic that makes up the pads, so you do not need to worry about getting little glitter shaped patterns in your cardstock or paper. I will order another set or 2 of these pads before Sizzix discontinues them or something. I love to find a pair of glittery cutting pads in Apple Green! Ok, when I ordered these I didn't realize they were glittery looking. Not that there is glitter on the outside that would come off, mind you. So they are different than I expected, but very pretty and perform just like the standard clear plates. Cutting pads are essential and these do the job, but they are also a beautiful color so they are easy to see compared to the original clear ones that just blend in. I love the new sparkle, it seems to inspire my imagination and creativity. Love the sparkle that's not pink!! Ordered these with my new Big Shot. Yes, two came with it, but I want to make sure I still have sparkled pads when it's time for a replacement. Love these plates....my favorite color! Matches my craft room decor & paint ( color of my walls is just a little lighter). So happy Sizzix came out with colored plates...good job Sizzix! Didn't realize these had glitter in them when I ordered but they are lovely and happy with the sale price. Wish my Big Shot was this color! Will these fit the spellbinders platinum? By: molloychic (21-Mar-19) Helpful Question? Yes | No Thank you! Report Inappropriate This question has been reported. Thank you! We do not recommend using any other cutting plates than the style the manufacturer recommends. It will void the manufacturer warranty. By: Scrapbook.com (25-Mar-19) Helpful Answer? Yes | No Thank you! Report Inappropriate This Answer has been reported. Thank you! Are these plates the C plates or the B plates? I recently purchased the Cuttle Bug only to discover that the machine only embosses unless C plates are purchased separately. Very disappointing to be apprised of this fact after receipt of the machine. If that was known at the time of purchase instead of having to trying to figure out which plates are which and attempting to obtain all that is needed in order to be able to use the product for the intended use. By: THEKOKID (29-Jan-19) Helpful Question? Yes | No Thank you! Report Inappropriate This question has been reported. Thank you! These are Sizzix cutting plates. Plates known as B and C are for use in the Cuttlebug, not Sizzix Big Shot. The C plate is necessary when die cutting as it is thicker than the B plate and dies are thinner than embossing folders. When embossing you use the B plates (2) because the embossing folders are thicker than dies. Cuttlebug is not made by Sizzix but the Big Shot is. What no one mentions is that the B plates and Sizzix cutting plates are the same thickness (but slightly different in length/width) and the Cuttlebug B plates can be used in the Sizzix Big Shot for embossing. I haven't tried the Sizzix cutting plates in the Cuttlebug yet but as the difference is mostly length, the Sizzix cutting plates will probably work in the Cuttlebug as well. Hope this helps. By: bbstevens (23-Mar-19) Helpful Answer? Yes | No Thank you! Report Inappropriate This Answer has been reported. Thank you! Will these work in the Vegabond 2? By: maknov88 (26-Nov-18) Helpful Question? Yes | No Thank you! Report Inappropriate This question has been reported. Thank you! This question is about a related product. I hope this helps. By: Amber Boren (29-Nov-18) Helpful Answer? Yes | No Thank you! Report Inappropriate This Answer has been reported. Thank you! Will they work on the Big Kick? I've never paid attention to size and figured they were all the same? By: User (04-Oct-18) Helpful Question? Yes | No Thank you! Report Inappropriate This question has been reported. Thank you! Yes they will. I have the Vagabond and they do a great job. You can verify this by going to the product page at Scrapbook.com. Hope this helps. By: Sally Burch (05-Oct-18) Helpful Answer? Yes | No Thank you! Report Inappropriate This Answer has been reported. Thank you! How thick are these? Length and width is listed, but NOT thickness. Thickness is what I need to know. FYI, although many die cutters all use the same thickness in plates, the cuddlebug has a 1/8" plate, and a 3/16" plate, which are used together, or separate, for different purposes, so I need to know thickness on this plate since it replaces one I broke. Please add thickness information to product description. Thanks in advance. By: User (26-Aug-18) Helpful Question? Yes | No Thank you! Report Inappropriate This question has been reported. Thank you! This item is 1/8th inch thick. I hope this helps! By: Amber Boren (31-Aug-18) Helpful Answer? Yes | No Thank you! Report Inappropriate This Answer has been reported. Thank you! Do these cutting pads fit the Big Shot Plus? By: kathythomas553 (13-Aug-18) Helpful Question? Yes | No Thank you! Report Inappropriate This question has been reported. Thank you! Yes, and you can put them through the machine sideways, saving a little time and effort. I rarely use the original Big Shot Plus plates as the size is rarely needed for 5x7 card sizes and they are bigger and bulkier to handle. By: bbstevens (23-Mar-19) Helpful Answer? Yes | No Thank you! Report Inappropriate This Answer has been reported. Thank you! They are sized for the Big Shot, but since they are smaller, I would think you could actually use them. But they won't be as wide as the ones made for the Big Shot Plus. By: thegenesislady (15-Aug-18) Helpful Answer? Yes | No Thank you! Report Inappropriate This Answer has been reported. Thank you! Is this for the SideKick? Do these pads enable a person to use Thinlits and Framelits with a SideKick? By: Bluepotoo (18-Jul-17) Helpful Question? Yes | No Thank you! Report Inappropriate This question has been reported. Thank you! the ocean blue cutting pads are for the big shot they measure 6.125" X 8.75 and are for other sizzix cutting machines, the side kick's cutting pads measure 5" so I don't think they will work in your side kick I use to have a side kick and all I used was the 5" cutting pads Thanks By: elway (20-Jul-17) Helpful Answer? Yes | No Thank you! Report Inappropriate This Answer has been reported. Thank you! 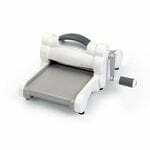 No, the Sidekick is a small manual machine for use with small dies that are not too big in width or embossing strips. The cutting pads for it measure 2 1/2" x 4 7/8" x 4mm. Hope this helps. By: bbstevens (23-Mar-19) Helpful Answer? Yes | No Thank you! Report Inappropriate This Answer has been reported. Thank you!